The Vancouver Condo Buzz » Exclusive Waterfront Richmond Blue Heron Marina Estates Homes for Sale from $1.7M with Moorage and Future Clubhouse! « FALL LAUNCH! The Shore North Vancouver Apartments by Adera > Sustainable Low-Rise Living with Central Piazza! Exclusive Waterfront Richmond Blue Heron Marina Estates Homes for Sale from $1.7M with Moorage and Future Clubhouse! Grand opening is on now at the waterfront Richmond Blue Heron Marine Estates. 9 brand new waterfront homes are now selling from $1,700,000 at 23740 Dyke Road Richmond BC. This brand new detached Richmond waterfront home project on the banks of the Fraser River is your ultimate luxury living experience on the water. The 9 home strata community also includes a future private marina clubhouse with full services and even moorage for those who have boats and yachts. The Blue Heron Richmond Marina Estates is south facing, which means that you will have plenty of natural light in your new home. The open floor plans and nine foot ceiling heights on the main floor are spectacular. You can enjoy the magnificent views of the mountains and rivers from many rooms too. Quality finishing throughout, the Blue Heron Marina Estates in Richmond BC will feature designer kitchens and sumptuous bathrooms. The Richmond waterfront homes will have four bedrooms and four bathrooms. The master bedrooms with views of the water and spa like ensuite bathroom are the ultimate. All counters will have granite stone tops and there are outdoor living patios and a three floor elevator in each home. Some of the other spectacular finishes at the waterfront Richmond Blue Heron Marina Estates includes solid plank walnut flooring, 65 oz Saxony carpets, deluxe Sub-Zero fridge and stainless steel Wolf appliance package. The ground floor at these Richmond waterfront homes features room for four more cars plus a large flex area. For more information about this grand opening launch at the Blue Heron Richmond Marine Estates, please register your interest online at their marketing web site at: www.blueheronmarinaestates.ca. The nine unit strata complex of beautiful marina estates and waterfront homes in Richmond BC are now for sale! Developed in 2 phases, the Blue Heron Marina Estates is a beautiful new community along the banks of the Fraser River in East Richmond where you will find a unique living opportunity. Phase 1 has the residential docks and homes while Phase 2 will involve the development and construction of an adjacent marina with clubhouse and moorage. Waterfront living with great views and spectacular interior finishes is now available. Some of the highlights of this Richmond waterfront community includes south facing waterfront lots with beautiful homes featuring 4 bedrooms and 3.5 bathrooms. There are three floor elevators as well as a 4 car garage! All homes will come with the standard 2/5/10 Home Warranty protection plan in addition to professionally maintained landscaping. The residential marina features at the waterfront Richmond Blue Heron Marina Estates will include U shaped moorage from 142’ to 185’ total feet with maximum slip lengths between 64’ to 96’ for rental. As well, there will be a new 8’ wide concrete engineered dock system and motorized loading assistance. There is a portable pump out station and security gates with closed circuit surveillance. The waterfront Richmond Blue Heron marina will have calm, deep fresh water moorage in addition to full dockside services including an onsite caretaker, maintenance and repair service. 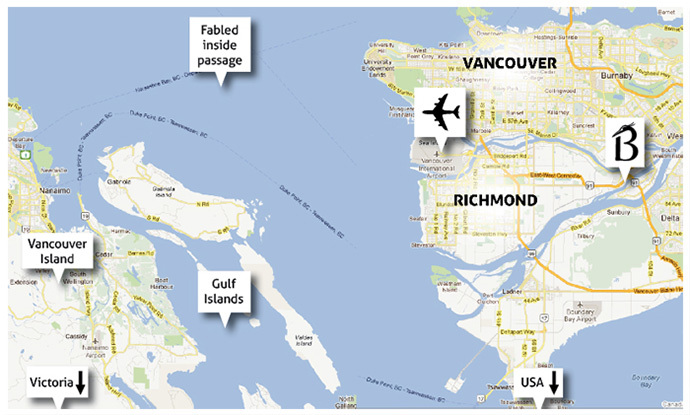 The 9 available waterfront Richmond real estate opportunities range from $1,700,000 to $1,950,000. In addition, the Blue Heron Club will be exclusive to marina members and home owners at the Blue Heron Richmond Marine Estate homes. There is an area that has a bar, food prep area, meeting space and a large open deck. There is also a dedicated area for minor boat repairs by owners.